Barefoot Angie Bee: No alliterative title for this crazy day, a List instead. No alliterative title for this crazy day, a List instead. Crazy wonderful life I lead!! I have been so blessed to have made loads of new bloggy friends out there. You all mean so much to me. The comments and support have been astounding over the last 6 months. I have felt a bit insecure putting myself out there into the world since much of what I do seems to be unconventional and yet I have been received and accepted with open arms. I made a new years resolution to blog once a week and it has exploded into so much opportunity. I even got a job out of it! I will be spreading the nuun love all this week here in Des Moines doing Hy-Vee samplings of nuun and then hanging out at the Hy-Vee Triathlon expo and race this weekend. I will be posting some celebratory giveaways later this week when I can fit it in to blog about it all. I hate to admit it but I wish I had a Droid or Blackberry! I miss my boys though and feel like I am always a little behind on everything. So for the sake of brevity and since I didn't get to run this morning and am racing daylight to get one in tonight I will embrace my good friend the bulleted list! I am featured on Run Like A Mother's book blog for this weeks "follow this mother". How frakkin tight is that!! If you have not read the book yet, you are so missing out! It made me laugh out loud, gave me so many good tips for time management and made me feel connected to the running mommas that head out there into the world to kick some assphalt. I am working on a post highlighting some of the things I have learned over the last year of barefoot running. I want everyone to remember that just because you run barefoot does not make you or your feet invincible. Taking it slow, and listening honestly to your body is key. Most peoples feet have adapted to shoe wearing and making the change to barefoot will take some time. There is strengthening and lengthening that will take place however it won't happen over night. Start with a half mile and see how you feel and go from there. Downhill running is an art. Its hard and challenging and must be given due respect. So today at my nuun sampling at Hy-Vee, I introduced lots of people to the joys of nuun and I did a lot of people watching. It started storming about a block before I arrived at the store and stormed like a mutha for about 2 hours and rained until right before I left. The store was quite desolate those first couple of hours.If if needed to shop I would have loved a dead store like that! When I did see people I was trying to guess the sport that they did or what they would have for dinner based on their shopping cart contents. I had a really annoying eye twitch and I didn't bring a snack so I munched on Shot Blocks throughout the 4 hours. I also had to pee at least once an hour if not more since I was standing there drinking nuun all day! My clever hubby bought me some mats to stand on to help with back ache from the hard floor and the musak wasn't too terribly bad. The kids that sampled were so eager and open minded and I learned of some MMA training gyms here in Des Moines. I realized yesterday that I have surpassed last years total running miles. I ran 525 last year and am up to 540 six months into this year with a goal of 1000 but am pretty sure I will surpass that if all goes well. I have also been running barefoot for a year now and PRed in all the distances I ran last year shod. I also want to celebrate the nuun gig too so there will be some of that to give away! This cat ran 102 miles in 24 hours BAREFOOT!! Check out this article. Dig the mohawk man, dig the mohawk! Don't forget to sign up for the Tropical Traditions Virgin Coconut Oil Giveaway! You might win a 32 OZ jar. Thats huge!! love, love, love nuun! What a fun opportunity. Very cool opportunity! Life sounds busy, but good, which is always nice. Wanna meet me at the border when I got to Wisconsin this summer? Busy is good; it gives us focus. When I have too much time on my hands, it seems to slip through. It's always a bit of an adjustment getting back to work. I know you'll be able to juggle everything around. and hear you with needing mats. i gotta get some yoga mats to bring with me to work too with this heel spur thingy of mine. The mats are a great idea! We always used them when we sold concessions for days on end. It helped sooo much. Great job on the doubles. I'm so happy that you're getting to run with your husband. I love it! It is so lovely you have done I am glad that now days there are people like you who can do this type of nice work. I am glad that you have created so nice blog so that other people also can get inspiration. Congrats on working with Nuun! Way to stay positive and cheerful even though it sounds like your life is crazy right now. So jealous of your job! Sounds like you have lots of good stuff going on! Feel the bloggy love! Isn't it wonderful? Nice miles for this year... you will blow 1000 out of the water! What a wonderful way for this to all lead your life. Who would have thought all this from blogging?! I read your feature on RLAM. Great write up! 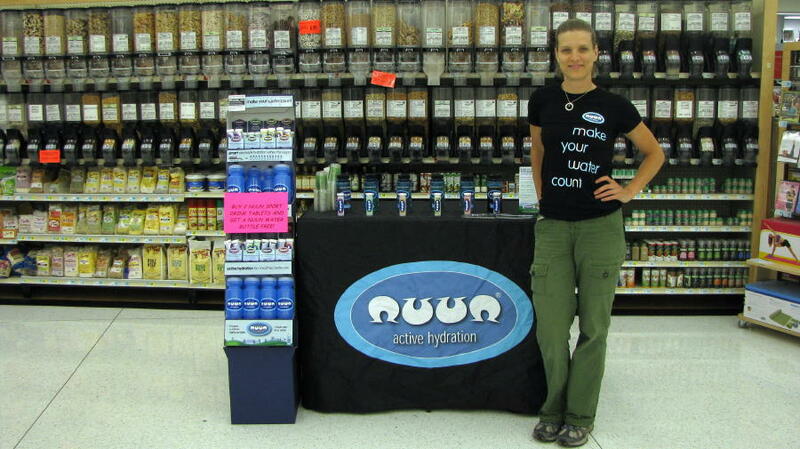 If I saw you standing there like that at your nuun counter, I'd think, dang, that chic is in great shape. You are perfect for that job Angie! Glad it found you and you found it. Made my first pair of huaraches last night. Thanks for the inspiration. I found you through "Follow this Mother!" Well, actually, I kept seeing your name pop up on the bloggy comments and I'm so sad I waited so long to come and visit! Very cool job, especially since I'm in LOVE with Nuun lately! Enjoy your weekend, I hope you might be able to squeek just one in! cool! I've got to try some of this Nuun stuff. Next time I go to the big city I'm buying some. You were the perfect candidate for the RLAM profile! So cool.